While my reviews of Brass Rail and Via 313 covered the basic concept of “Detroit-Style Pizza” in detail, that doesn’t mean that every place in Detroit serves up pizza that style. 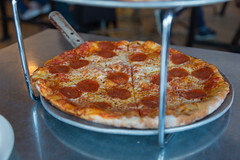 There are many places around the Detroit area serving up traditional, round, Italian-style thin-crust pizza done well. 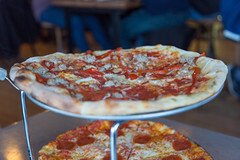 Indeed, at several of the breweries I visited, I asked people where their favorite pizza was, and there was a general consensus around one place having the best overall pizza in Detroit, and that was Supino. Supino is located just across the street from Detroit’s famous Eastern Market (itself a worthy food destination, offering up fresh foods and vegetables for over 150 years through Detroit’s various economic wax and wane cycles), and it’s named after Supino, Italy (the owner has roots there). It’s a rather nice spot, with a nice, large, brightly-lit dining room with a large bar, where you can sit and gaze out at the Market or the not-too-distant downtown skyline. 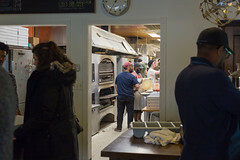 Over by the main door, you can get a nice look into the kitchen with a good series of deck ovens and a counter for tossing and assembling pizza. Menu-wise, Supino is definitely more of the Italian-American pizza tradition than the Detroit style: it’s all round, thin-crust pizza with a choice of red or white sauce, and selections of toppings ranging from traditional (pepperoni, primavera, or margherita, for example) to a few quirky ones (like the Affumicata with smoked prosciutto, roasted garlic, chopped parsley, mozzarella, smoked gouda, and ricotta). They’ve also got a rather good selection of insalata and antipasti as well, although my dining group (my college friends Brian and Ben) opted to stay with some traditional meat pizzas: a pepperoni, and a San Gennaro (with onions, roasted red peppers, and sausage). I’ll start with the pepperoni pizza, since along with a magherita pizza, it’s pretty much my “standard” pizza for evaluating how good a pizza place is (every place has it, and doing it well without it getting greasy or burnt actually takes a bit of talent and timing). 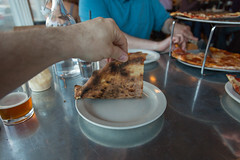 And this was a solid, Italian-style pizza: good pizza is all about crust, and the crust here was a nicely roasted crust with more than a little char on it (I always like to flip over the pizza and look at the bottom), with a nice slightly puffed cornicione. Add in a robust tomato sauce that mostly tasted of good sauce tomatoes and salt, a nice layer of just-starting to crisp cheese, and a layer of pepperoni that was just starting to crisp around the edge… and this was one of the better pepperoni pizzas I’ve had in recent history. Supino’s got the basics down. For our other pizza, we chose the San Gennaro, a nice variation of my other standard pizza order (sausage and mushrooms), basically a sausage, onion, and red pepper pizza, and again, this is a very well executed pizza: same excellent crust, sauce, and cheese, with some slightly caramelized onions, some nicely toasted peppers, and some crumbled sausage just strating to crisp up and render down. I’d happily get this pizza again as well. 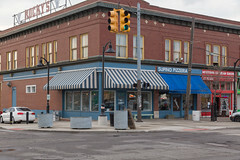 So, when in Detroit, it’s not always about square Detroit-style pizza: Supino is producing some excellent Italian-style pizza, of a quality that would hold its own in most any American city. I’d love to come back.